I’m a music enthusiast, who isn’t? When I was looking for some record stores in the city, A Good Day Records was probably the first one I was curious to visit. After a quick look at their media platforms, listened to the music they released I got in touch with Juno, who's managing artists for the label. She kindly invited me to stop by & took the time to introduce the store & label in the presence of Diana, another employee. Could you tell me more about A Good Day Records? Diana: A Good Day Records started in January 2003. At first, it was a tiny record store where we essentially sold CDs from foreign independent music label. From any particular record label? Juno: Our boss wanted to sell music he took pleasure in listening to. In the library, there are mostly CDs from a Spanish record label called Siesta Records. 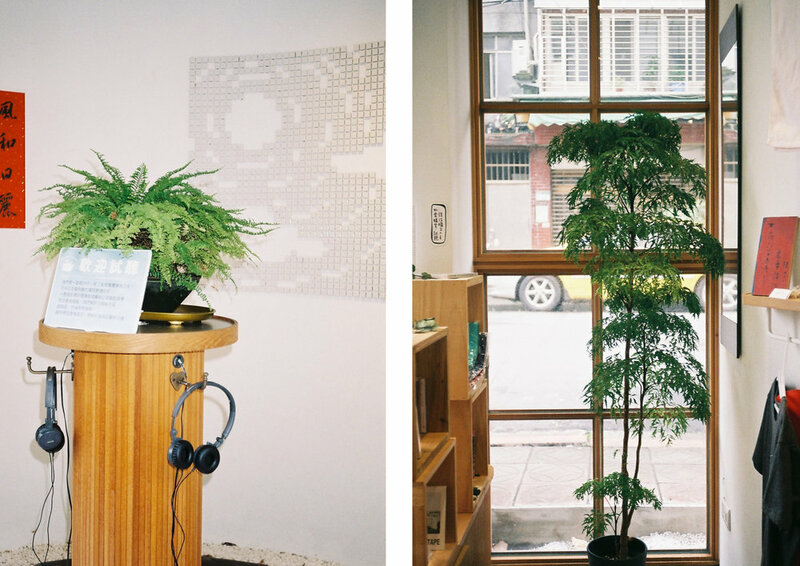 In Taiwan, there weren’t many places where you could find that kind of music, although the space he owned was small and the traffic not that prolific, his intentions remained consistent, he kept going further. Of course, at the beginning it was though because he was running the business on his own, he was the only employee. Juno: Then, he collaborated with another artist 929 (♫), followed by Dadado Huang (♫). Diana: All the CDs you can see in that side of the store (right entry) are the ones we released, we designed and you can find the merchandising we produced. Merchandising for the artists advertising? Juno: Not only for those artists but for the label as well. For example, if we are hosting events, we will create some merchandising for those special occasion! What happened next? Following the opening of his record label to reaching more artists & managing them. Diana: To promote their career the artists have to produce themselves in live warehouse. Our founder thought that it wasn’t appropriate for all of them since each artists has their own qualities or specificities. Natural Q for example, they began their career by singing in coffee shops, 929 had an opportunity to perform in one of the biggest live warehouses in Taipei: The Wall. He didn’t choose this space, instead, he decided to perform in one of the Eslite Bookstore locations for his debut show which was a success. How many artists do you guys manage now? Diana: Some of them I mentioned before close their partnership with the label this past year. We are managing Dadado Huang and 柔 米 Zoomie (♫), which is a new artist signed. We released her album last year. What kind of sound are you guys looking for when signing a new musician? Juno: I will define our music style as Indie. The musicality plays a major role however that’s not solely what we are looking for, especially in Chinese, the lyrics are sometimes more relevant, they have a deeper meaning which clearly influences and inspire people. Juno, could you tell me what is your day to day job? You have to wait for them to produce contents to go on tour, or is it sometimes not necessary? Diana: Nowadays I think you don’t need to produce an entire album to go on tour, if you are releasing an EP or even a single it is enough. Our musicians need time to produce their music, to finish an album, they are doing everything by themselves. We have to wait, we try not to put that much pressure on the release of any projects. Diana: Yes, and by doing this you cannot go wrong, you are always reaching a new audience, stimulating their creative process. Juno: Sometimes, by waiting for them to release new songs, we host label events. Diana: We organized three music festivals. One in 2010, 2012 and 2017. Where was the first one? Juno: It was a one-day festival held at an outdoor cinema, we invited our artists, 929, Dadado Huang and a few other. Each singer was performing on the stage then we broadcasted videos on the screen. Diana: For the second festival we invited 10 artists in the course of six months. Juno: 2 artists were performing each month. We were thinking about making a change in people mindset, why throw a music festival that always lasts in between 2 or 3 days? Our artists collaborated with several ones, from different musical genres, Dadado Huang sang alongside a Hip Hop artist. Juno: In 2017, we organized our biggest yet, an outdoor festival that lasted two days in Yilan. Diana: A place where nature reigns. The main concept was Pause and Play. The idea was simple: Take a rest, for the weekend, stop everything you’re doing to breathe a little, try to not overthink and just enjoy the music and after that, you can go back to your daily activities. We also held a lot of workshops. Juno: It was like a small Fuji Rock, nearby the river. Do you guys don’t release Vinyle, is it a legitimate choice? Diana: Well actually we released one Vinyle: She & Me (♫) from CiaCia (何欣穗). Juno: You know since a few years, this medium is getting popular again, and we also produced some audiotape last year. Diana: Since everyone doesn’t own an audiotape player we added a Qr code inside so you can scan it, listen wherever you are. So people can come and spend the day at the store listening to music? Diana: Yes, music is something that will last forever, by having this CDs library, the owner’s collection, you will always carry those memories in a physical aspect. 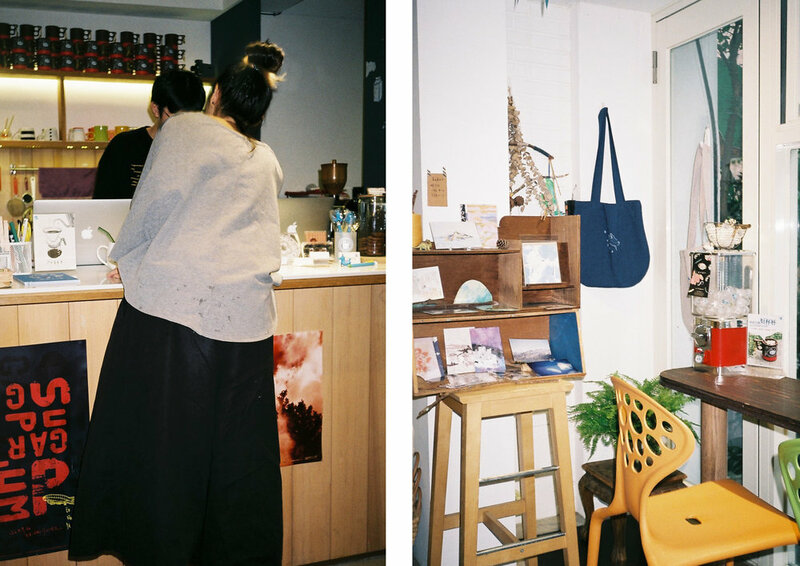 Juno: People can come here every day, by paying 215 NT$ (≅ 7$) to stay all day. Streaming quality isn’t equivalent, a bit lower in term of sound quality than the CDs we are carrying so, we will provide an walkman. We also gathered people around lecture or music gigs. Diana: It is an event called After work folks where we are promoting musicians. Everyone sit down we are giving pillows, blankets, and are serving few drinks. What about the exhibition space, do you guys change regularly, can you tell me more about it? Diana: We are doing exhibitions related to photography & music. The exhibition we had at this moment is about our artist Zoomie, she shot pictures about her daily life. Juno: The pictures you can see are also in her album. It was important for us to show another part of her personality. Diana: Yes it is true. Juno: Communication is the key. We will discuss a lot with the artist and observe what they enjoy. We think it is always better if the artist can provide something. Diana: The company never interfere with their creations, their songs, we never put pressure on them.